This is a review of a scam called “My Millionaire Mentor”. It is presented by Ryan Mathews. We are reviewing My Millionaire Mentor although it is not really connected to binary options. But we came across its presentation and saw famous scammers’ faces, so we decided to warn about it. In fact the presentation of My Millionaire Mentor is exactly the same as with all the binary options scam we have seen. There are allegedly limited spots, you can become millionaire very quickly, the creator of the system is super rich, etc. This system is promoted by spam, but in the presentation you can here that you can get in only through an exclusive invitation, what a bad joke. Limited spots are of course a joke too. But let’s see some tangible proofs. All the My Millionaire Mentor testimonials you can see in the video are fake. They were made with paid actors. 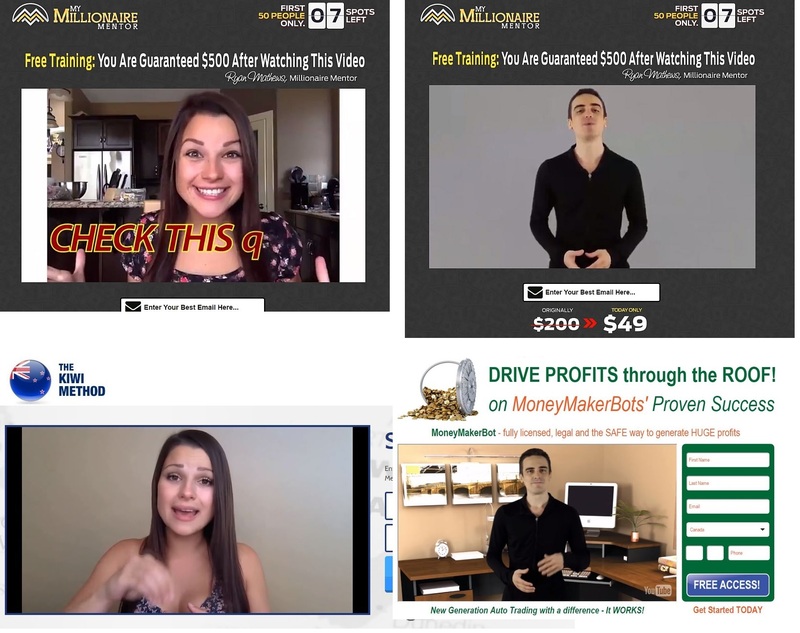 We’ve seen these people supporting binary options scams like The Kiwi Method or Money Maker Bot, see the picture on the right. Paid actors lying about their results with the system = 100 percent scam. The best thing with My Millionaire Mentor is that they admit that they are lying to you in their video. 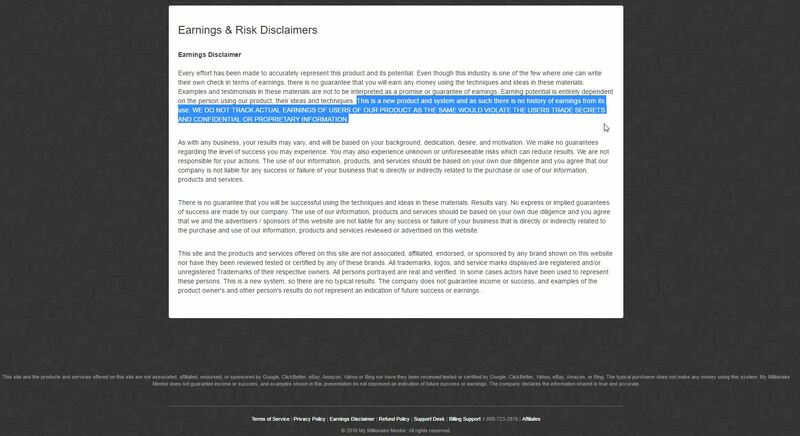 Read the Risk Disclaimer and you’ll see that in fact this system has no real results, because it is new! So this proves that the testimonials are absolutely fake, including the story of Ryan Mathews. My Millionaire Mentor is a scam because it uses fake testimonials and a video full of lies. So stay away from it. Thanks for this review. Another reason this is a SCAM? Well, I have no idea how my e-mail address was located, however, about three weeks ago I started receiving between 20-60 emails every day from this “company”. I unsubscribed which resulted in more e-mails.They use hundreds of fake names. I am reporting this company to the Federal Trade Commission and will review the FBI’s page to see if they have criteria for a complaint of this kind. So then how do you stop all these stupid emails from spamming in? Ive tried adding filters and rules to my email address and it keeps on coming, the names, subject and messages in the body keep changing making the rules redundant. It’s difficult, now it seems that the best thing is to just ignore it and certainly not click any links. I’ve been doing that and it seems that I am getting less and less of these e-mails.